Simply breath-taking! This Sanibel Island waterfront home as been featured on HGTV and is available for your extended vacation! 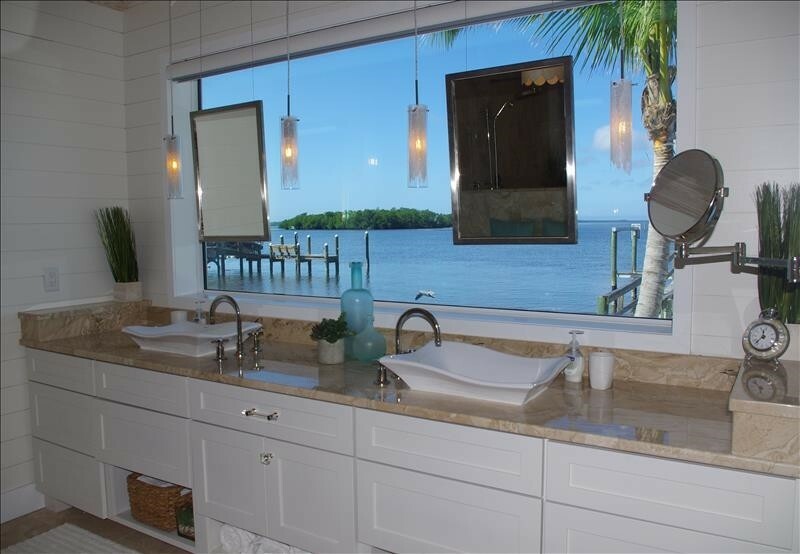 Enjoy fantastic views of Tarpon Bay at this beautiful, historic Point of View home. Tarpon Bay is 50 feet from the house. Yes, the water is THAT close! Bring your boat and settle in for a month or longer at this beautifully restored 1932 Sears Roebuck Catalog home. Point of View is located on the historic and secluded Woodring Road, overlooking Tarpon Bay to Pine Island. The historic Point of View home was built in 1932, and the 3 bedroom, 2 bath, 2000 sqare foot home has been beautifully restored and updated to include modern conveniences like central air conditioning, heat, a laundry room and an updated kitchen. The original Slash Pine floors and Pecky Cypress walls remain intact. 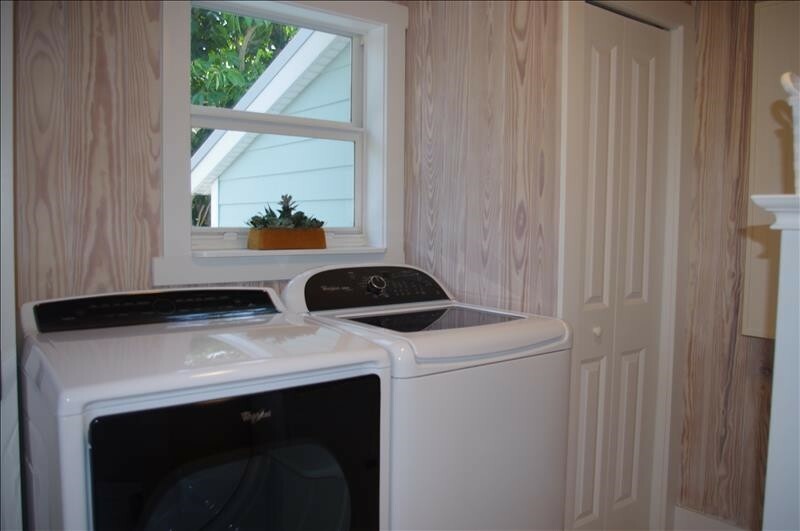 The 2-story home features the living room, dining room, kitchen, laundry, 2 bedrooms and a shared bath on the main level. Upstairs you will find a dormer style bedroom, with 3 twin beds and a 3-piece bath. The first thing that catches your eye when you walk into the home is the bay. The water views are incredible. The fully-equiped kitchen features granite countertops, beadboard cabinetry, Kitchen Aid appliances and a wine captain. The dining room seats 8 comfortably, and the table has a leaf that can easily be inserted to seat additional guests. The living room features a sectional sofa, flat panel tv/dvd and amazing views of Tarpon Bay. The family room is next to the living room, and is a perfect spot to read, write or take in the bay view. There is a sofa that seats 3 comfortably, and side chairs. Just off of the living room and kitchen are 2 bedrooms and a guest bath. 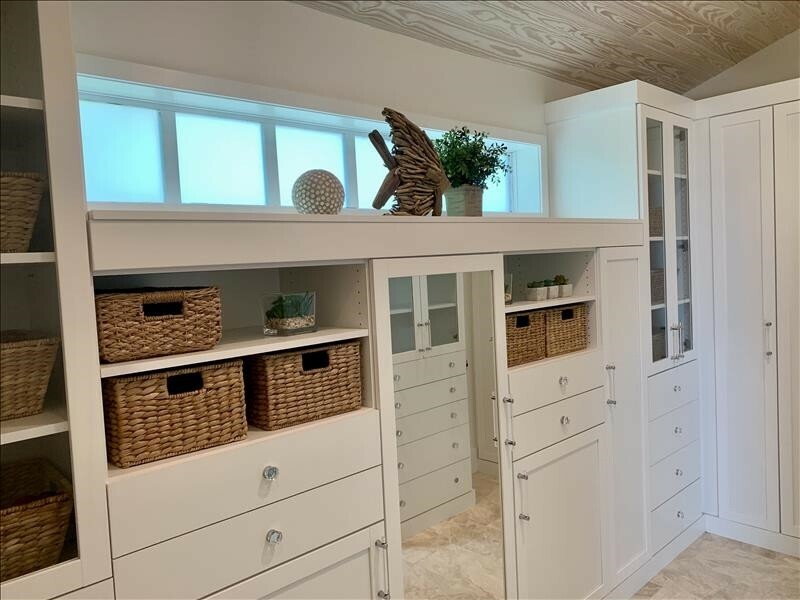 The Master Bedroom faces the bay and has a King bed, with an en-suite Master Bath featuring Lefroy Brooks fixtures, along with a walk-in California Closet. You wake up and fall asleep with the waters’ edge just beyond your toes. The Queen guest bedroom has views of the garden and is located at the front of the house. It has a flat panel tv, bureau and plantation shutters to control lighting. 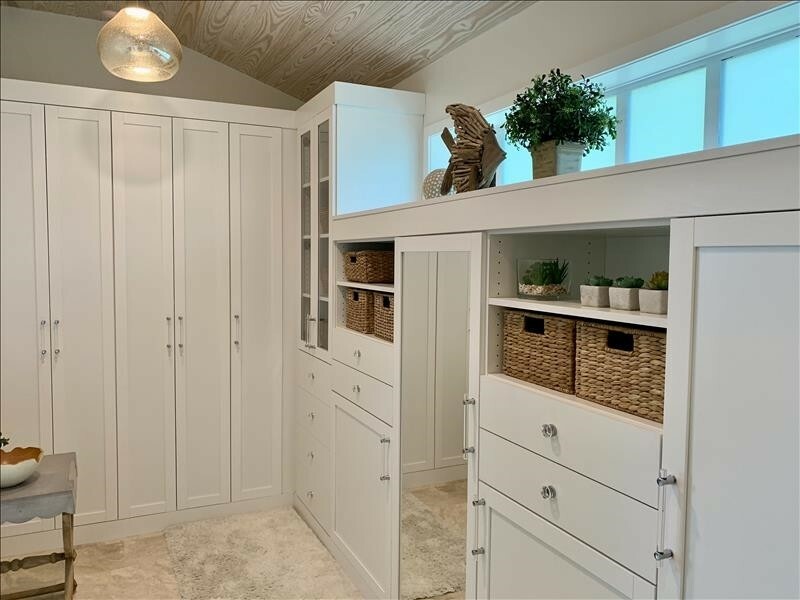 Between the two bedrooms is a 4-piece period bathroom featuring St. Croix claw tub with an overhead rain shower head , pedestal sink and toilet. 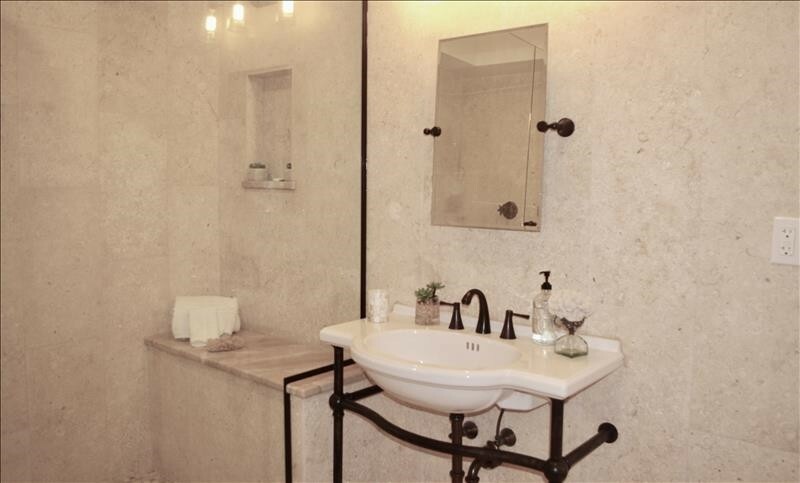 Travertine flooring and walls make for a spa-like feel, along with 1-touch adjustable lighting. A spiral staircase leads upstairs to the spacious guest bedroom with its 3 twin beds, reading chaise and en-suite 3-piece bath. 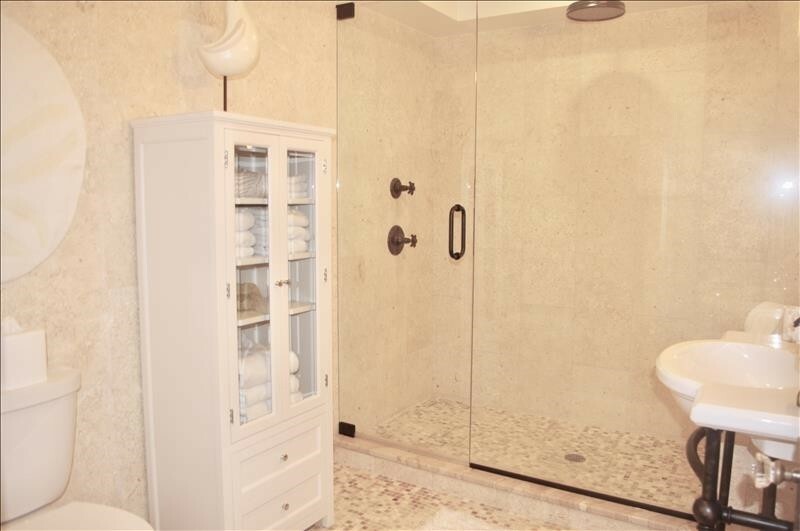 The bathroom has a travertine shower, flooring and walls, with a vessel pedestal sink/vanity. 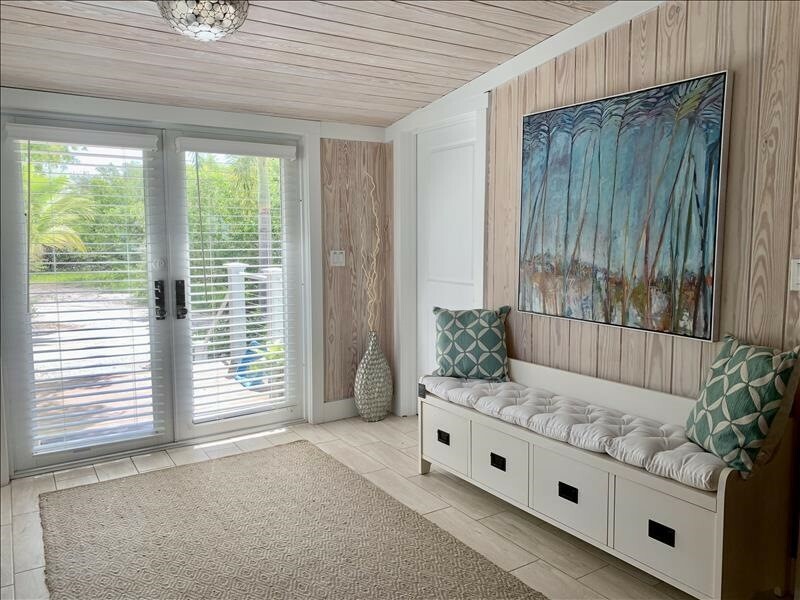 Hunter Douglas 1-touch retractable blinds and plantation shutters are throughout the Point of View home. You can easily open and close them to allow just the right amount of light in. Sliding doors off of the living and family room and master bedroom lead to the outdoor deck. There is a table that seats 4, a gas bbq grill and side chairs off of the master bedroom. Three steps down puts you right on the beach. There is a boardwalk walkway leading to the docks, with a fire pit, chairs, 2 chaise lounge, and 2 kayaks with life vests for your use and enjoyment. 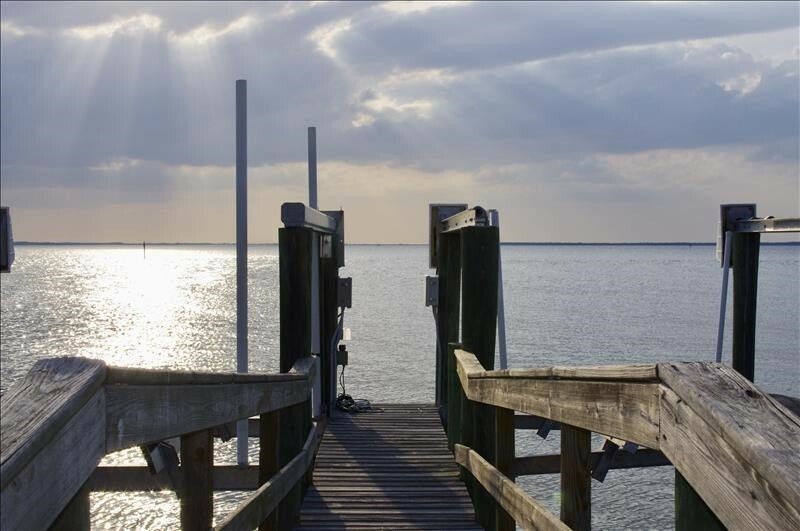 The dock has 2 boat lifts, and you are welcome to bring your own boat! Fishing or crabbing from the dock is spectacular, and Tarpon Bay is a birder’s delight, with hundreds of species migrating through each year. Egrets, herons, spoonbills, pelicans and sanderlings are an everyday sighting at the house. Tarpon Bay is the cradle of tarpon fishing. The first tarpon caught on rod and reel was in 1885 by W.H. Wood using bait and thumb stall reel with linen line right here on Sanibel in Tarpon Bay. Tarpon Bay is part of the J.N. ‘Ding’ Darling National Wildlife Refuge. Point of View is professionally managed by Cottages to Castles of Sanibel & Captiva. is professionally managed by Cottages to Castles of Sanibel & Captiva. Since 1997, Cottages to Castles has been making sure that you have everything you need to make your stay a memorable one. 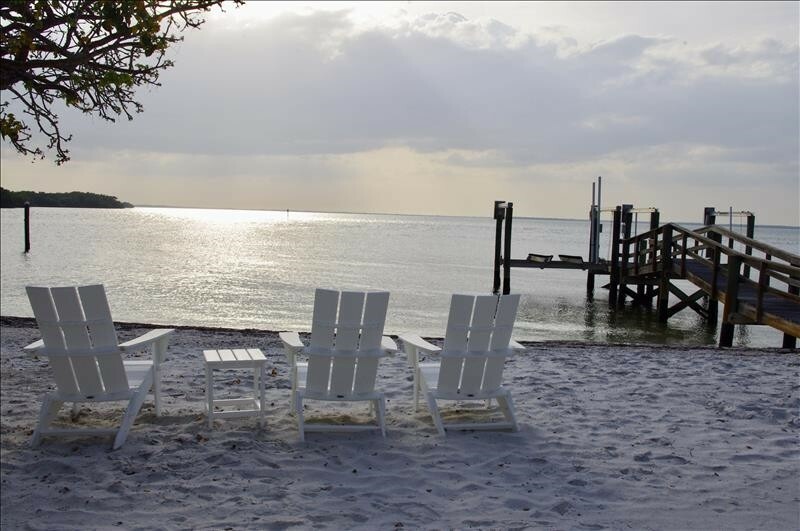 Point of View is zoned by the City of Sanibel for minimum 28 night rentals, no exceptions. Pet Friendly with prior owner approval and payment of a non-refundable pet fee. Rental rate is based on 28 nights. Additional nights are pro-rated out. Payment of a refundable security deposit is required to confirm a reservation. Please contact me with information regarding Point of View Home. Great stay on Sanibel Island-nice island pace!!! We rented the Point of View home for a month over Christmas and New Years and loved everything about it. It’s charm, view, and private setting. Our four children enjoyed fishing, kayaking, and crabbing. They hardly ever touched their iPads!!! This has easily been our best family vacation, ever. Everything was perfect! My favorite part of the house is the Master Bathroom window! There was nothing I didn’t like! We tried our best to take good care of it. We had a wonderful Christmas here and had many adventures. The boys filleted their first fish, and I read two whole books. Sharon, Amy, and Connie were great at making sure our experience was 2nd to none. We rented the Point of View home for a month over Christmas and New Years and loved everything about it. Its charm, view, and private setting. Thank you so much for the joy of this experience! 2017 has been a long year for us, and this family vacation has been just what we needed to relax, enjoy nature, exercise, play games and enjoy each other. The beauty of the place is unmatched. We all had an amazing month in your wonderful house, everything you need and you desire is right there, organized and in perfect place to be used or to be found. The nature is inside the house and you can really relax, just waiting that something happens and surprises you! We loved everything and we all will miss that amazing view. Your house is the most beautiful in the neighborhood and fit perfectly our taste – we are Italian! So difficult to find words for how grateful we are to have vacationed in your glorious home. We have had a wonderful time at Sanibel and Captiva. We are sad to leave this paradise. God bless you and your entire family, as you all have hearts of gold! Thank you so much for sharing your beautiful vacation home. This home and setting is truly a paradise. Every day there was something new to see, admire and appreciate. We enjoyed biking, kayaking, paddle boarding, fishing, shelling and over eating! Most of all, we enjoyed sitting in your back yard, relaxing as we watched for dolphins and birds. We couldn’t stop taking pictures! Seeing such amazing sunsets right from your living room – unbelievable! Our last day here was a rainy day, and it was still fun. I won playing Pictionary – you have thought of everything. The binder with advertisements and phone numbers was most helpful. We can’t thank you enough. This vacation was one of a kind. We will never forget your kindness. We were surrounded by beauty inside and out, just like your family. Thank you, thank you, thank you. We have had a lovely time in your “Point of View” house on San Carlos Bay. You have anticipated every possible need within and organized and beautifully decorated house. We have treated it with all the respect that it deserves. Tonight we will enjoy one last gorgeous sunset and will be looking forward to more next March. Your beach home is absolutely fabulous. Your touches are everywhere – lovely, thoughtful and so organized! We are so fortunate to be able to spend time with our family and this was an added bonus. The time helped to heal my body and spirit. Thank You. How can we ever thank you enough for inviting us to spend time in your beautiful home? This was one of the most relaxed and enjoyable vacations we have ever had. Thoroughly enjoyed our stay at your lovely home. Thanks for sharing it with us. Thank you so much for sharing your beautiful home with us. It was a bit of paradise. So peaceful and calming. Your home is beautiful and decorated to make everyone feel at home and welcome. We thank you from the bottom of our hearts.